After today's close, Dow jones, S&P500 and Nasdaq moved above 200 ma. 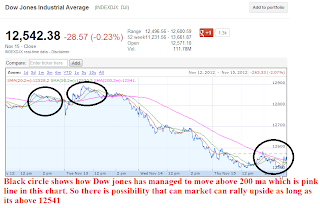 If market recover tomorrow, then there is high chances of dead cat bounce rally. But if it fails then stock will test 12649 on dow and 1344 on S&P500. Remember if Obama speaks sell your stock, otherwise it will be high volume day. Industrial production of 0.2% is expected at 9.45 am EST. Also Greece needs to make 5 billion payment. Based on the chart, ,market is expected to open lower. For bullish sentiment to continue, Dow jones need to move above 12577 followed by 12625 and S&P500 need to break 1357 and 1363. For bearish sentiment to continue, Dow jones need to break 12507 followed by 12469 and S&P500 need to break 1344 and 1339. 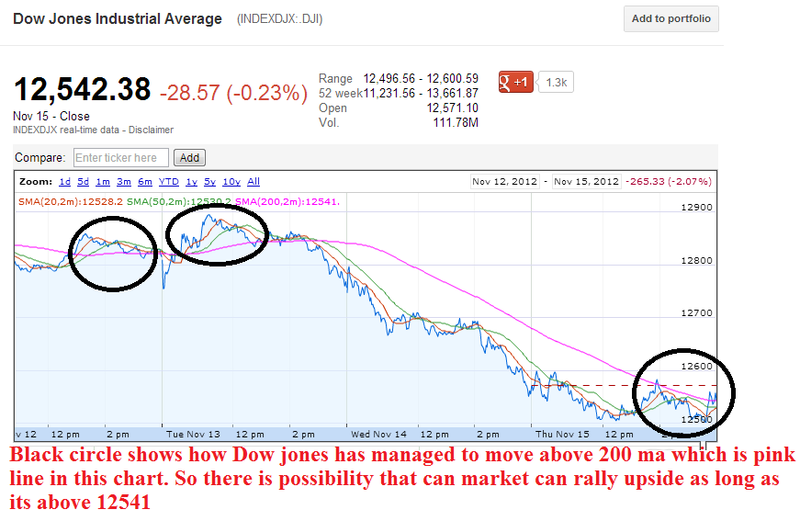 Dow jones above 200 ma at the close.